The Super Bowl is Over. Can We Get Back to Hot Women in Short Skirts? Alright. Enough of this Super Bowl crap. Let's get back to what's really important in advertising; hot women in shorts skirts who sell liquor on a billboard. Yes. After all, why discuss the insipid idiocy of, say, the Doritos Crash the Super Bowl dreck when you can focus on the ingenuity of high quality creative such as that display on this billboard for Angostura Rum. The ad, which features a woman in a very short, booty-revealing skirt mocks Scotland's kilt-wearing men with the headline, "In Scotland, men dance in skirts. 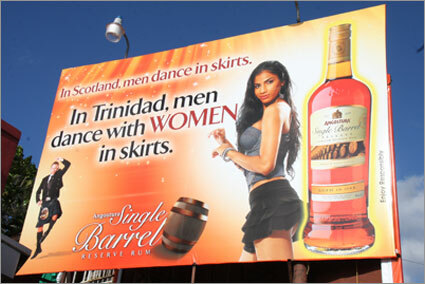 In Trinidad, men dance with women in skirts." Of course, the Scottish are pissed off calling this affront akin to crossing some sort of boundary regarding the country's choice of dress. Why would this bother those in Scotland? We thought the Scottish liked to drink and laugh a lot. Oh wait. That comment might be misconstrued as stereotyping. Sorry. Here's another ad from the campaign.